We are exhibiting at Regen 2015! We are excited to be exhibiting at the Regen 2015 conference & exhibition at St George’s Hall in Liverpool on the 24th & 25th of March. We will be exhibiting alongside many other great companies from across the UK and we are looking forward to making new contacts and creating new business opportunities. After the huge success of the 2014 event, Regen has become the industry’s leading forum for thought leadership in UK regeneration and economic development. The Conference will address the issues in urban regeneration policy and highlight the key successes made in major towns and cities. Are you coming along? Please pop by and see us for a chat, you will find us on stand C5! Did you know we now manufacture stainless steel Finger Post Signs in-house? Call us on 01254 700213 for more information or e-mail enquiries@goosefootuk.com to discuss what we can do for you! Goose Foot is a street furniture specialist. As an original manufacturer, we can also design and custom-build products to your specifications, in batch orders or as one-off bespoke street furniture products. All Goose Foot Street Furniture products are manufactured to the highest standards in our onsite workshop with all the latest Laser Cutting and Robotic Welding Technology which is why we can offer cost effective prices. 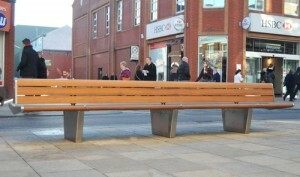 Goose Foot Street Furniture was selected by Lancashire County Council and the urban architects Planit-IE to design and manufacture nine bespoke, four metre long seats. These iconic seats are located in the Fishergate Central Gateway Project, Preston and also outside the railway station. In addition, we supplied a further 7 Emperor seats for Phase 2 of the development in 2015 as well as 2 bespoke tree seats. The project focuses on the delivery of a high quality public realm with re-configuration of key gateways to enhance the overall attractiveness of the City Centre as a viable business location, and act as a catalyst for private sector inward investment. One of the main themes of the project is to focus on creating a sense of place by enhancing the City Centre’s architectural heritage with new, vibrant built environment to bring Fishergate into the 21st century. Goose Foot is proud to have been chosen as a key partner in the city’s ongoing regeneration. Preston City Centre has seen many benefits as a result of the Fishergate Central Gateway Project, which has significantly improved the main approaches to the City Centre. In total, Lancashire County Council ordered 9 of the iconic seats which are placed evenly throughout the new scheme. Designed and manufactured by Goose Foot in their state of the art facility in Darwen, Lancashire, each seat measures 4m x 1m and constructed using marine grade 316 stainless steel and ethically sourced supplies of Iroko. Working closely with the County Council and Planit-IE on the initial design, the focus was to incorporate all feedback and produce seats that are eye catching, hard wearing and extremely comfortable. Widely recognised as one of the fastest growing street furniture companies in the UK, Goose Foot continues to offer both bespoke and off the shelf furniture solutions across the public and private sectors. Goose Foot is a street furniture specialist. As an original manufacturer, we can also design and custom-build products to your specifications, in batch orders or as one-off bespoke street furniture products. If you can’t find what you’re looking for within our range, contact us today so we can come up with bespoke a solution that will meet your needs. WEC Group worked closely with Kin Design to produce a stainless steel outdoor seating installation for the ITV HQ at Media City in Salford. The installation also features an interactive colour wheel, which staff and the public can use to interact with a logo sitting on top of the building. It’s been a busy period of change for ITV, from completely rebuilding and moving the Coronation Street set and production studios to launching their brand new corporate identity. ITV wanted to find interesting ways to increase its visibility around Media City. Our parent company WEC Group worked closely with Kin Design on this bespoke street furniture project, to develop an outdoor seating area that was not only functional, but sculptural and interactive. The 16m long stainless steel ‘ribbon’ was formed and fabricated over a period of 8 weeks to match Kin Designs’ 3D CAD model. The sections were individually polished to a uniform super satin finish including the blending and dressing of all the welded joints. For the installation, the sections were lifted into place using a 100t Hi-ab crane, positioned, fixed to the ground, welded, re-polished and painted on site. The stainless steel ribbon was inspired by the curved form of ITV’s new logo, twisting and turning to create seating spaces, lean-to “bar” like spaces and reclining spaces which have all been tested for ergonomic comfort. 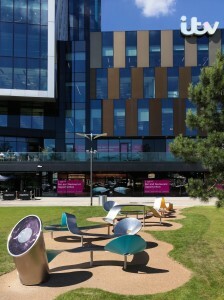 The installation sits in the piazza area of Media City in front of the ITV building, a space open to staff and the general public for them to meet, eat, chat and interact with each other. Anti-skateboard nodules have been developed and added to the side of the sculpture so it is not misused. The underside of the sculpture is painted in the ITV colour palette, and at the end of the ribbon there is an interactive terminal with a touch-screen and a colour wheel. People are encouraged to customise the ITV logo by filling the colour wheel with different colour combinations. When the visitors are happy with their final design, it is then transmitted to the 5m high ITV logo on the top of the building in front of them. Bespoke software means that Hue Saturation and Lightness (HSL) values can change the red, green and blue LED lights in the logo. The customised design can then be uploaded to their personal Facebook page or Twitter, all directly from the touch screen of the pod. Goose Foot is a street furniture specialist. As an original manufacturer, we can also design and custom-build products to your specifications, in batch orders or as one-off bespoke products. If you can’t find what you’re looking for within our range, contact us today so we can come up with bespoke a solution that will meet your needs. About the company Goose Foot Street Furniture Ltd is one of the fastest growing street furniture manufacturers and suppliers in the UK. All Goose Foot Street Furniture products are manufactured to the highest standards in our onsite workshop using only the latest Laser Cutting and Robotic Welding Technology. After manufacturing seats for various street furniture companies over the years, we are able to provide bespoke seating to customers’ specifications on either a subcontract basis, in batch orders or as one-off bespoke products. 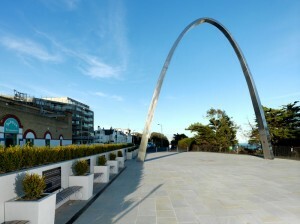 Please visit our sister company m-tec’s website to view more architectural metalwork projects.